Custom content is added to site pages using content gadgets. You can format the text, using inline formatting or text styles, or use ArtText to create stylized text with special effects such as drop shadows. You can link text and pictures to a page on your site or another site, and provide links to documents stored in your account or on another site. For content gadgets, you can layer and overlap content so that text can appear on top of a picture, for example. To display the content editor while editing a site page or page template, position your pointer over a content gadget then click anywhere within the gadget. Now, you can use the options appearing on the content editor toolbar to add or modify the content within the gadget. To display the content editor while editing an email, email template, or event description, simply click within the email body or event description. To provide precise control over the positioning of content within a content gadget, you can create a layer, then add the content to the selected layer. In this way, you can position the content anywhere you want, even overlapping the content with other content. For example, you could use layers to overlap text and pictures. Layered text is not responsive on mobile devices. If you need to position text over a graphic, consider placing the text in a content gadget and insert the graphic as the content gadget's background image. You can use the gadget margins and padding to position text relative to the graphic. To create a layer, click within the content gadget, then click the Layer icon and select the Create new layer option. A new layer with default text ("New layer") will now appear on the gadget with selection handles around it. You can modify or delete the default text, and add other content to the layer. To add content to layer, position your pointer within the layer and either type your text or use the toolbar options to insert other content. 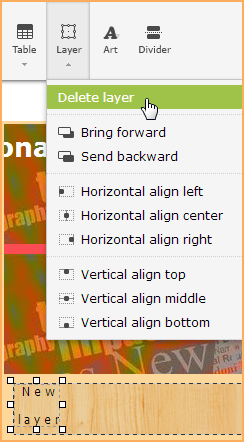 To resize the layer, drag the selection handles in or out. The side handles controlling the width, top handles controlling the height, and corner handles controlling both height and width. To move the layer within the gadget, position your pointer within the layer and drag it to a new location. As you move the layer, the content within the layer moves as well. 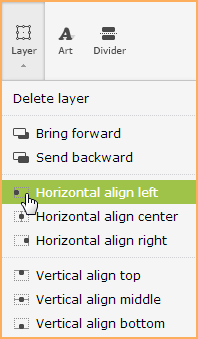 You can also use other options appearing under the Layer icon to control the position of the layout. These options allow you to align the layer horizontally or vertically to the middle or edge of the gadget, email body, or event description. To delete a layer, select the layer – so that the selection handles appear – then click the Delete layer option under the Layer icon. 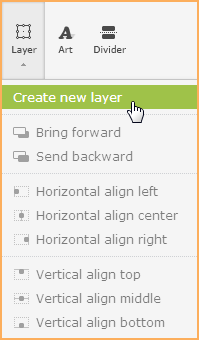 If you have added multiple layers, you can control the layering order by using options under the Layer icon to move the currently selected layout forward or backward within the order. For example, if the currently selected layer is partially obscured by another layer, you can move the current layer further up the stacking order by selecting the Bring forward option. You can undo and redo up to 10 of your most recent editing actions. To undo your most recent editing action, click the Undo icon within the content editor toolbar. After undoing an editing action, you can redo the action by click the Redo icon within the toolbar. You can undo and redo actions only within the editing session for the current gadget. The moment you shift focus from the current gadget to another gadget, the editing session for the current gadget ends. You can also restore the previous version of a page. For more information, see Version history.